My long loved rhubarb crumble cake has been my favourite rhubarb cake so far, but these little meringue tartlets caused a change on my list. I can’t say that I prefer them over my buttery cinnamon crumble (I made the apple version a couple months ago, the recipe is here) but they are definitely just as good! Until I started taking the ingredients out, I wasn’t even sure about the recipe. 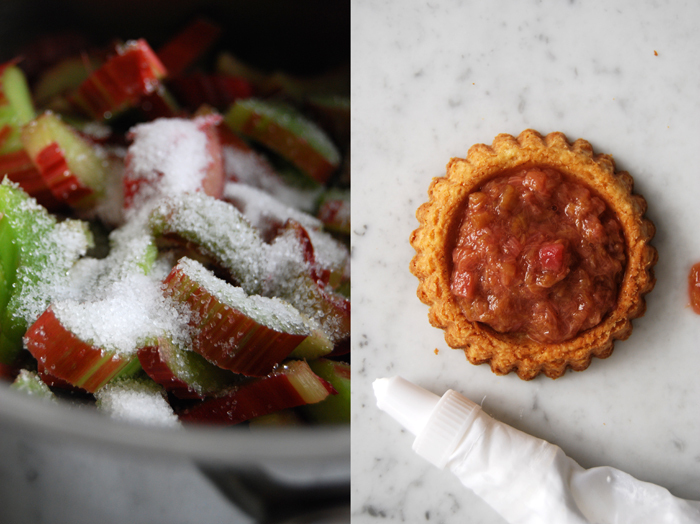 I wanted a crumbly short crust, strong enough to carry the juicy rhubarb compote and not as flaky as the one I make for my Tarte Tatin. 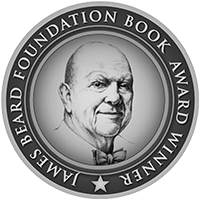 I thought I would give it a try but expected that I would have to refine the recipe over the next few weeks before I would be rewarded with a satisfying result. I was wrong! The pastry was exactly what I wanted, buttery, crumbly with a strong structure, neither too fragile nor to compact. 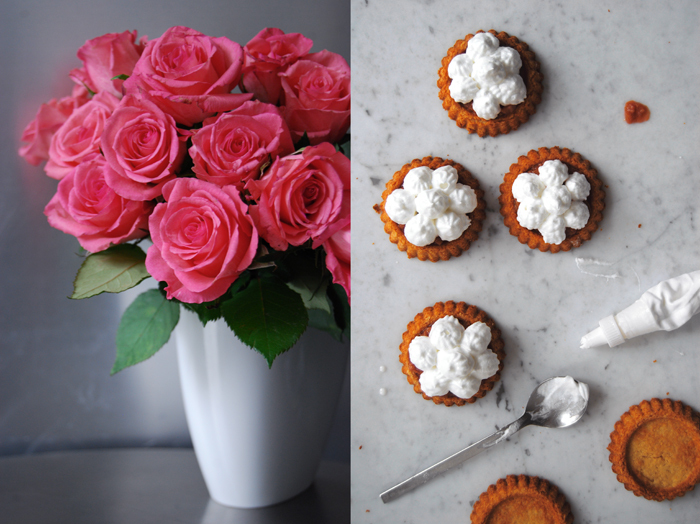 When the tartlets had cooled off, I topped them with a tablespoon of my thick rhubarb compote and some fluffy meringue. As I’m not very good at decorating cakes, I tried to keep them simple. Usually I try to avoid piping bags as they make me nervous but here I made an exception, I wanted them pretty! The result was worth it, a bit sweet, a bit sour, buttery but still light, and all of this in a cute little rhubarb meringue tartlet! When the tartlets are finished and baked with the meringue, you should serve them within the next 15 minutes as that’s when they are at their best (I had one the next day and it was still delicious but a bit softer). If you want to prepare them for guests, you can bake the tartlets and cook the compote beforehand (both should be cold either way). Then you just need to beat the egg whites, assemble the tartlets and bake them for 3 minutes in the oven. You will need round 10cm / 4″ tartlet pans. Combine the flour with the salt, vanilla and sugar. Cut the butter with a knife into the flour until there are just little pieces of butter left. Continue with your fingers and work the butter into the flour until combined (there shouldn’t be any lumps of butter left). Add the egg yolks and continue mixing with the hooks of your mixer until you have a crumbly mixture. Form a thick disc, wrap in cling film and put in the freezer for 10 minutes. Set your oven to 200°C / 390°F top / bottom heat. 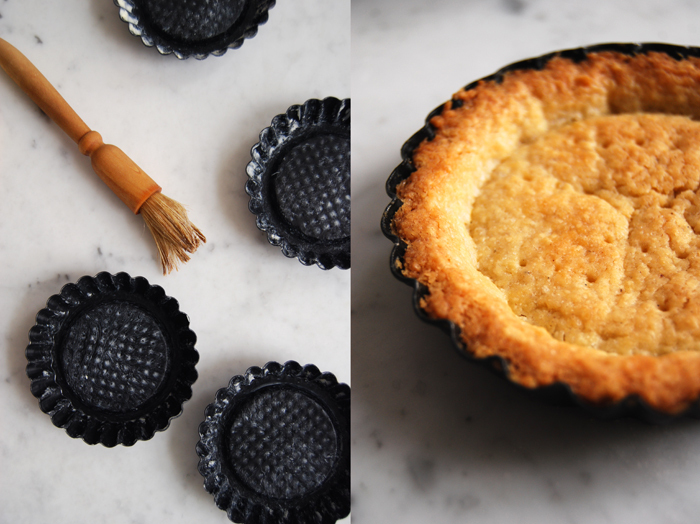 Butter the tartlet pans and dust with flour. Roll out the dough about 3mm thick between cling film and cut out 10 12cm / 5″ circles. Line your tartlet pans with the pastry and prick with a fork. Blind-bake in the hot oven for 9 minutes or until golden. Take them out, let them cool for a couple minutes before you flip them over and let the tartlets cool off completely. In a sauce pan, heat all the ingredients for the compote on medium temperature, keep the lid closed. Cook for 10 minutes or until the rhubarb has become a thick compote and let it cool completely. Set the oven to 220°C / 430°F top / bottom heat. Beat the egg whites with the salt for 10 – 20 seconds until they start to stiffen. Add the sugar gradually and continue beating until stiff and glossy. 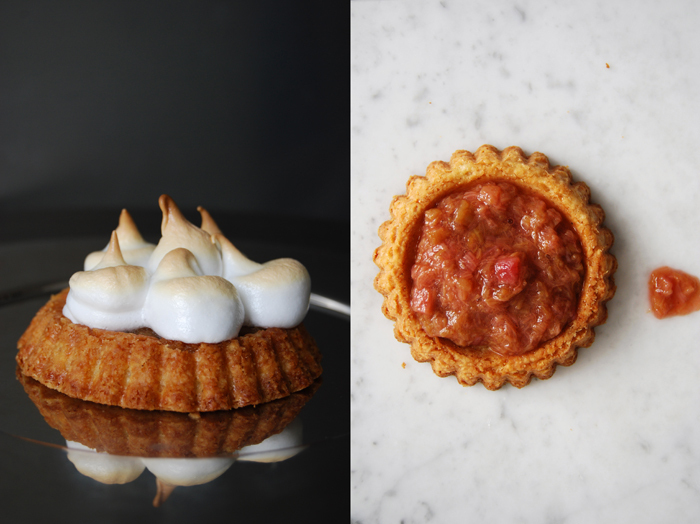 Put a tablespoon of the rhubarb compote on top of the tartlet, spread evenly. Fill the meringue mixture in a piping bag and decorate generously. Bake them on a baking sheet for 2-3 minutes until the tops of the meringue become golden. 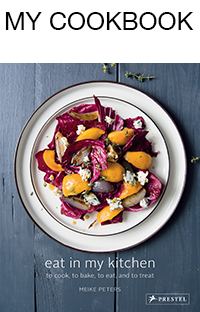 Let them cool for 1 minute, put them on plates with a spatula and serve immediately. 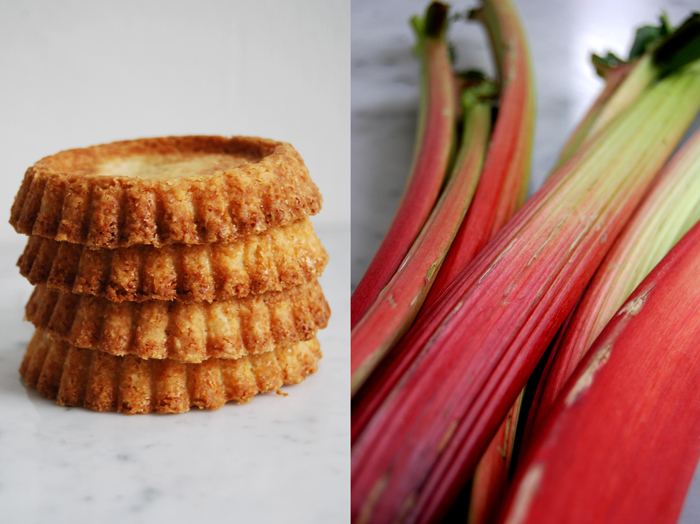 Rhubarb is my absolute favourite and these tarts sound like the perfect way to enjoy it.